The Goodwood Breakfast Club celebrates hot hatches and motorcycles for the first time in 2014. Staged on five occasions from May to November, with free entry,. this ever-popular event is now entering its ninth season. The all-new Hot Hatch Sunday on 5 October mixes iconic high-street machines like the Volkswagen Golf GTi and Peugeot 205 GTi with modern favourites like the Ford Fiesta ST and the Renault Clio 200 Turbo. Vee-Power Sunday, on 2 November, brings two-wheeled exotica to the Breakfast Club for the first time as V-twin Harley Davidsons share the spotlight with mighty V16 Cadillacs and Bugattis, and everything else in between. While the new themes add an exciting extra dimension to Breakfast Club, the ever-popular Supercar, Soft Top and Thoroughbred Sundays return for 2014. The dedicated and detailed Goodwood Breakfast Club website has regular updates on each monthly theme, and for 2014 visitors must pre-register here to have a chance of their theme-relevant vehicle being displayed on the circuit. 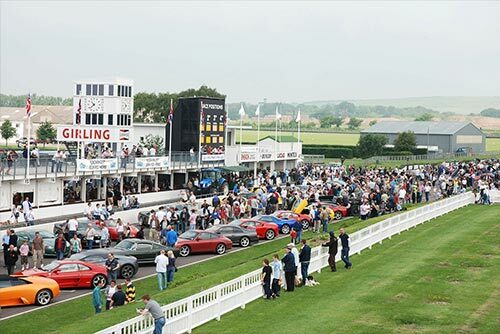 All 2014 Goodwood Breakfast Club events will be staged from 0800-1200 hours on the first Sunday of the month (except in July and September due to the proximity to the Goodwood Festival of Speed and Revival events).